Kampong Glam is the Muslim center of Singapore, and is traditionally home to mosques, carpet shops, and Middle Eastern cuisine, while more recently the area has seen a surge in boutique cocktail bars and funky restaurant openings. Sightseers will enjoy the picturesque streets with their beautifully restored shophouses, while shoppers are in for a treat with a selection of Singapore’s best offbeat boutiques selling cult labels and vintage clothing. As the Muslim center of Singapore, Kampong Glam is home to the city’s biggest mosque, the Masjid Sultan (or Sultan Mosque) - its huge golden dome and four minarets cannot be easily missed. Bussorah Street is one of the most picturesque streets in the whole of Singapore, with its tiled pedestrian area, heritage architecture, and palm trees, while Kandahar Street around the corner is home to some of the most beautifully restored elaborate shophouses in the whole city. The area is also home to the Malay Heritage Center, its nine galleries showcasing the history and culture of Singapore Malays. Kampong Glam is traditionally associated with Middle Eastern cuisine – and you will find an abundance of reasonably priced Lebanese, Turkish and Egyptian restaurants here. Many establishments are Halal; so don’t expect to enjoy a beer with your kebab, although you are welcome to smoke a shisha after dinner. Kandahar Street is famous for its Nasi Padang restaurants – a cheap and cheerful option for buffet-style Malay/Indonesian fare, with Sabar Menanti a standout choice. Blu Jaz Café is a long-term favorite for budget bar food and beer, while Piedro Negra on Haji Lane is a relative newcomer offering Mexican cuisine and cocktails. Until recently much of Kampong Glam’s nightlife centered around apple tea and shishas in the area’s alcohol-free cafes. Blu Jaz Café has long bucked the trend, with its packed calendar of live music and comedy nights, and cheap beer and cocktail deals. More recently the area has seen a surge in boutique cocktail bars and restaurants springing up within the heritage shophouses. These bohemian, edgy establishments target the city’s media and ‘cool’ crowd, and make a welcome change from the glitz and glamour of the city centers roof bars and trendy nightclubs. Kampong Glam is traditionally associated with budget accommodation, with Sleepy Sam’s on Bussorah Street being a long-term favorite with backpackers to Singapore, although it has since been superseded by more high-tech offerings in Chinatown. The Sultan, housed in ten historic shophouses with a distinct Arabic slant to its design, will appeal to boutique hotel lovers looking to enjoy affordable accommodation in an ethnic atmosphere. Budget business travellers to Singapore often choose to check into the nearby Park View Hotel on Beach Road. 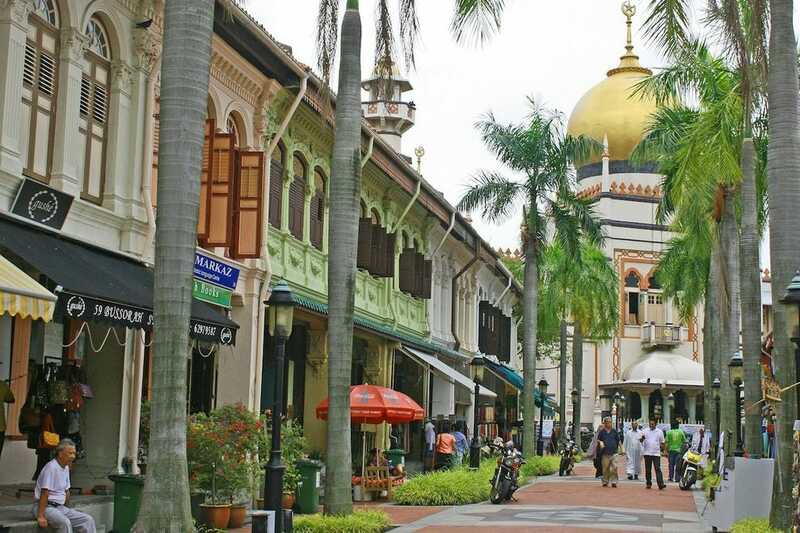 Many people head to Arab Street for its abundance of carpet and fabric shops, while Bussorah Street is home to a string of souvenir shops, with the odd antique or jewelry store in amongst the mix. The area is also known for its vintage clothing boutiques, and Haji Lane is one of Singapore’s hidden gems for shoppers. This narrow shabby lane is lined with offbeat boutiques selling cult labels and vintage clothing stores, and offers a different world of shopping from the glitzy shopping malls that Singapore is famous for.